*When sizing Inverted Flare Fuel Bowl Inlet Fittings when looking at the image the "Inside thread" is on the left side and the "Bowl thread" size refers to right side of the fitting. The Holley Fuel Bowl Inlet Fittings for Holley carbs include adapters for AN hose, inverted flare hard tube and rubber hose (Barbed) to the fuel bowl. 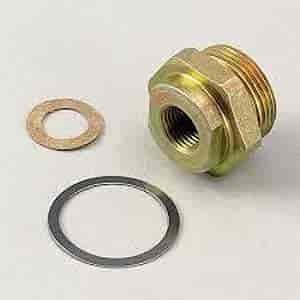 The inlet fitting plugs and gaskets prevent dangerous fuel leaks! Fittings are sold 1/pkg unless stated otherwise, gaskets are sold 2/pkg. *When sizing Inverted Flare Fuel Bowl Inlet Fittings when looking at the image, 510-26-26 for example, the "Inside thread" is on the left side and the "Bowl thread" size refers to right side of the fitting.